If you've never cruised in the British Virgin Islands, this is your year. And if you're a BVI regular? This is your year to introduce it to friends who don't know what they're missing. With crystal clear water, steady breezes, friendly hospitality, and endless inlets to explore, spending time in Frenchman's Cay on Tortola will provide some much-needed fun and relaxation. When approaching the entrance to Soper's Hole, the channel markers are on the north side with good clear water all the way in on both sides. If you are coming to the dock from another BVI port, best to come into the dock along the south side. If coming from outside the BVI, it is BVI law that you clear in through customs: grab a mooring ball or anchor, then dinghy to the customs dock located on the northern side of the harbor before stepping ashore anywhere else. 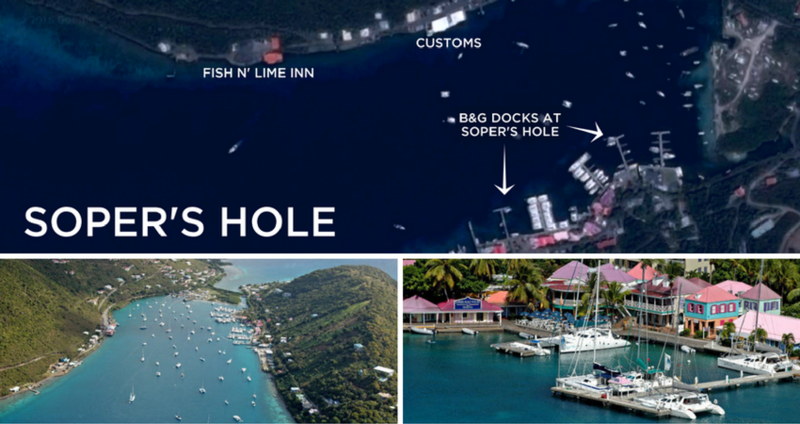 B&G Docks at Soper's Hole is located on the south shore of the harbor, directly across from the BVI Customs & Immigration office and ferry terminal. Within the marina complex is Harbour Market, which has basic supplies, fresh fruits and vegetables, meats, cheeses, and a well stocked frozen section. 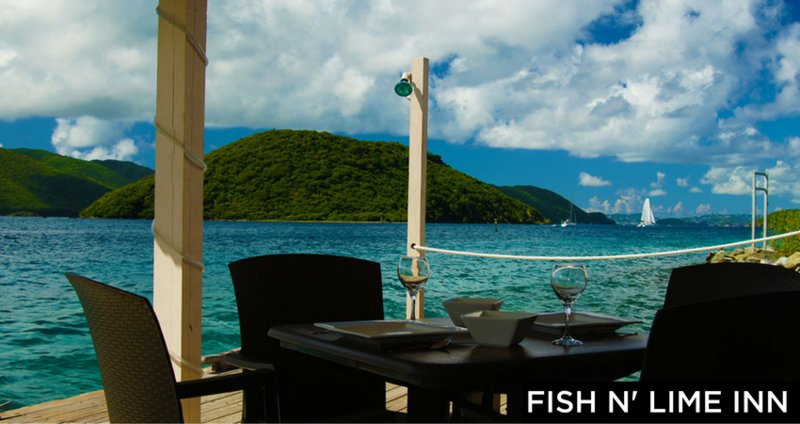 Scaramouche, know as one of the best restaurants in the BVIs, is located right in the marina. Enjoy the Italian cuisine in a beautiful evening setting, or partake in their festive Sunday brunch. For lighter fare, Fish n' Lime is across the harbor; take a quick dinghy ride over or go by foot for a nice 15 minute walk. They frequently have fresh fish on special along with their regular menu. For history buffs, the Sugar Mill Restaurant is an 8-minute drive from Soper's Hole. Before it was converted from a working sugar mill, sugar cane was boiled here for rum. Remnants of the equipment and the boiling pots used are still on view. 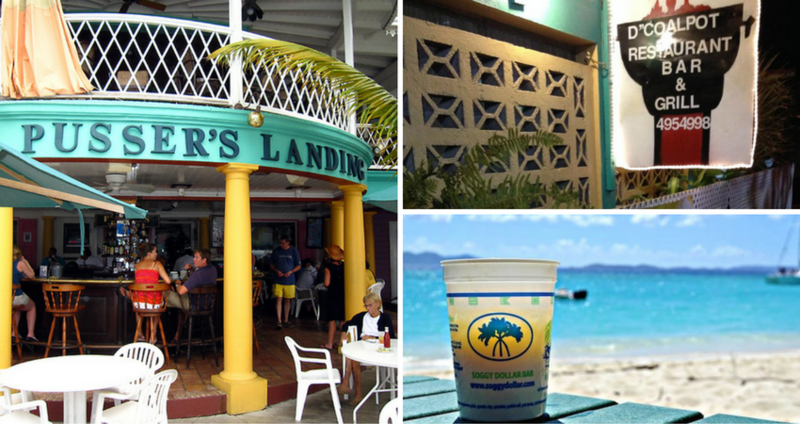 Pusser's Landing is located within Soper's Hole, a short walk from B&G Docks. Try a painkiller made with Pussers rum. D' Coalpot, which serves great BBQ and local Caribbean fare, is another local favorite. It is 5-minute taxi ride from the marina and well worth it. The restaurant can get a bit warm, so dress appropriately. There's plenty of nightlife throughout the winter in the British Virgin Islands. 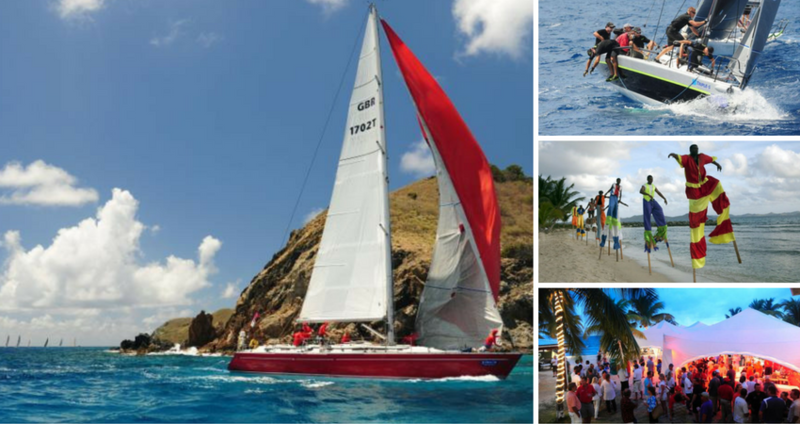 The biggest local sailing event on Tortola is the annual BVI Spring Regatta. For three days each April up to 100 sailboats compete in the Sir Francis Drake Channel and the surrounding islands. Most years the boats will race through the southern edge of Soper's Hole, making for a wonderful sight. Great wind, fun competition, and highly entertaining beach parties sound like your cup of rum? Click here to register to race in BVI Spring Regatta or join the crewlist. 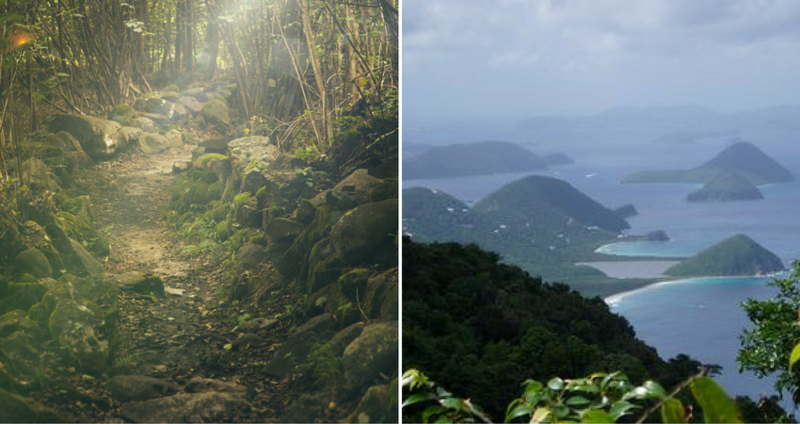 There are a number of great hikes around the island of Tortola. The recommendation from the team at B&G Docks at Soper's Hole: Sage Mountain. This trek is a great opportunity to stretch your legs and provides one of the best views of the Virgin Islands. Ask the staff at the marina for intel, or check out this new guide to hiking the BVIs. Off the southeastern tip of Jost Van Dyke, Sandy Spit is a beautiful uninhabited coral island with constantly shifting sands. A few palm trees and sea grape trees make up the center of the island and depending upon the shifting sands, you can circumnavigate this little haven in just over 3 minutes. Sandy Spit is great location to launch your kite board or lounge in the water with family and friends. Heading to the BVIs? Book on Dockwa, then chime in on Facebook and tag us on Instagram to let us know!